I am so easly influenced! A dear friend had a date night with her hubby and had so much fun that she suggested that my hubby and I also make it a date night and go see this movie 'Stardust'. 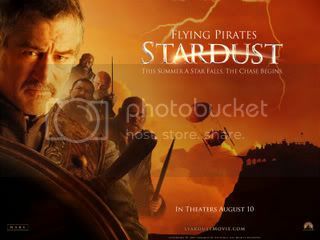 Anyhoo, if you haven't seen 'Stardust', you really must get out and see it. This one is well worth the watching. It has action, suspense, humor, and romance. It does have witches, so if you're fairy tale sensitive, you might want to pass on this one as it does have the classic evil witches similar to The Brothers Grimm. Some of the scenes were so hysterical that the whole audience was laughing out loud. Both my spouse and I found this a charming love story well worth watching together. Oh, I'm so glad you reviewed it! I just didn't know what to say without revealing major blocks of plot. Vinegar works for the same reason as tomato juice. The acidity breaks down the odor. And I had vinegar on hand. 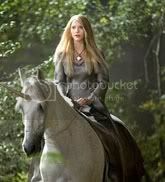 We also dowsed her with Nature's Miracle. The problem is most of the skunkiness is on her face (told you they aim for the eyes) and I don't want to hurt the dopey cat. My dear husband would have been happy to leave her out, but I figured she would get into less trouble if we just brought her in. It looks like your links are all working. At least, the ones I got to. Don't change anything until I get a chance to explore some of them more fully. We're going back to the ancients this year. Marina is already excited about your mythology link. This has been an incredibly busy week that is only half over. I think I can tell you with authority that I have seen every animal exhibit at the Bronx Zoo. We haven't got "Stardust" over here yet but will have in the next few weeks. It sounds great & I think we'll go & see it. Since moving here from HSB, I've found everything technical is so much incredibly easier. BTW, I love your blog name and I loved the Harry Potter movie & the new book, which I still won't say much about for fear of revealing too much plot to others.